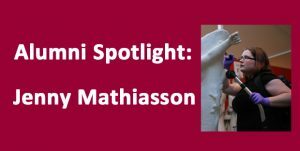 Welcome to Alumni Spotlight, a blog series focused on our alums – where they’ve been and where they are now. 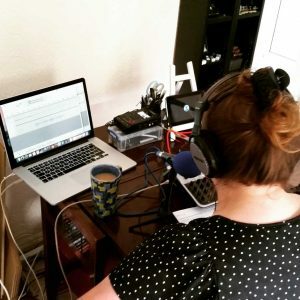 For this installment we interviewed Jenny Mathiasson. I was one of the first survivors of the then brand new MSc Conservation Practice degree! I’ve done a long distance learning course in Heritage Education since then but that’s about it. I’m a sucker for outreach so I just really wanted to add that to my conservation portfolio. Turns out talking to people is nice. Who knew? What have you been doing since you left Cardiff? Where are you now? Are you still in the heritage sector? I am! I’ve worked on various projects in Cardiff, Cambridge, and London since graduating and now I’m based up in South Yorkshire. 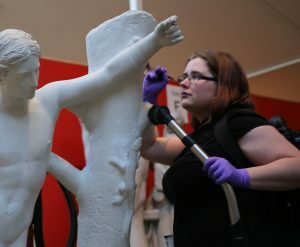 I’m the conservator at Clifton Park Museum, a local authority run museum in a great big park. I also run Clifton Conservation Service which is based there. I do a bit of freelancing and I really enjoy commercial work. Part of my job is actually commercial: I’m the museum’s conservator half the time and a scalpel for hire on behalf of my employer the rest of the time (another income stream for the museum). 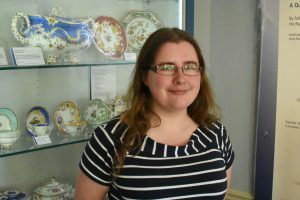 I mostly work with other local authority museums aiming to display something extra special for an exhibition, and with members of the public who want something precious looked after. 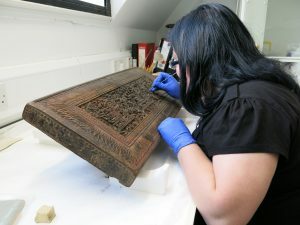 Very different challenges but at the end of the day the conservation work is really, really fun. It gave me confidence, practical experience, and some wicked problem-solving skills. Those are all vital to anyone who wants to get anywhere in conservation, I think. Well we were the guinea pig generation so anything that we wanted changed will have changed now! Our feedback will have formed what you guys are experiencing today in many ways (just as your feedback will shape the programme in the future). I always enjoyed the variety of objects we saw in the lab: my workbench is just as mismatched and wonderfully odd today as I work with really eclectic collections! 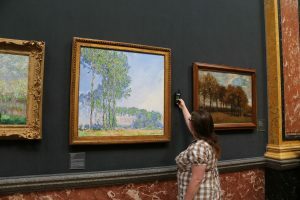 Hey, funny you should mention podcast: I’m actually one of the people behind The C Word: The Conservators’ Podcast. Go give us a listen if you’re into that sort of thing. We’re really relaxed and cover a wide range of topics. You can also follow me on Twitter or Instagram, I’m @curatedjenny on both platforms. It’s a mad mix of content but conservation is certainly included! Big thank you to Jenny for taking her time to share with us. Be sure to check out the C-Word Podcast for all things conservation and museum related!